Ambient vibration measurements with small, temporary arrays that produce estimates of surface wave dispersion have become increasingly popular as a low-cost, non-invasive tool for site characterisation. An important requirement for these measurements to be meaningful, however, is the temporal consistency and repeatability of the resulting dispersion and spatial autocorrelation curve estimates. 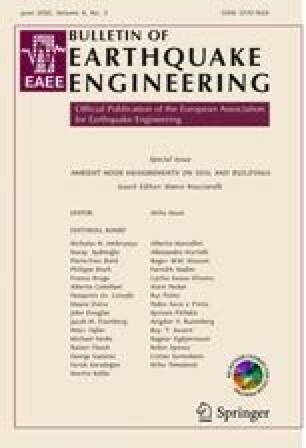 Data acquired within several European research projects (NERIES task JRA4, SESAME, and other multinational experiments) offer the chance to investigate the variability of the derived data products. The dataset analysed here consists of repeated array measurements, with several years of time elapsed between them. The measurements were conducted by different groups in different seasons, using different instrumentations and array layouts, at six sites in Greece and Italy. Ambient vibration amplitude spectra and locations of dominant sources vary between the two measurements at each location. Still, analysis indicates that this does not influence the derived dispersion information, which is stable in time and neither influenced by the instrumentation nor the analyst. The frequency range over which the dispersion curves and spatial autocorrelation curves can be reliably estimated depends on the array dimensions (minimum and maximum aperture) used in the specific deployment, though, and may accordingly vary between the repeated experiments. The relative contribution of Rayleigh and Love waves to the wavefield can likewise change between repeated measurements. The observed relative contribution of Rayleigh waves is generally at or below 50%, with especially low values for the rural sites. Besides, the visibility of higher modes depends on the noise wavefield conditions. The similarity of the dispersion and autocorrelation curves measured at each site indicates that the curves are stable, mainly determined by the sub-surface structure, and can thus be used to derive velocity information with depth. Differences between velocity models for the same site derived from independently determined dispersion and autocorrelation curves—as observed in other studies—are consequently not adequately explained by uncertainties in the measurement part.